We always enjoy a quick retreat to the closest State Park to our Richmond home. We decided to escape to Brazos Bend State Park during the week before Spring Break locked it up with families with school kids. If you go there between Sunday afternoon and Friday afternoon, you almost have a private park. We decided to go down Tuesday, the 11th and return the afternoon of the 14th. This is barely enough time to make all the loading and unloading worthwhile, but we always enjoy our visits. 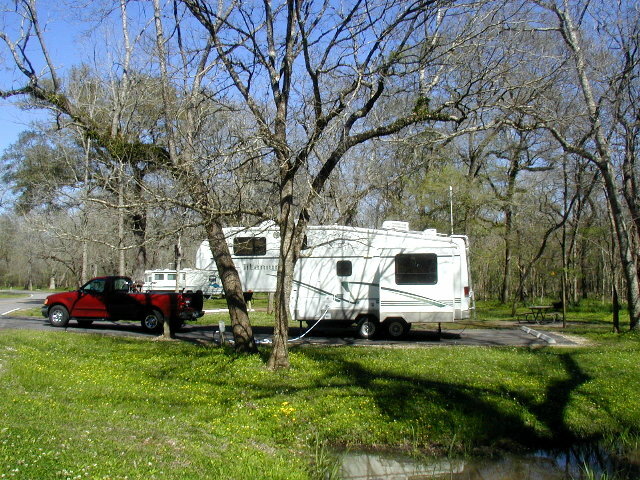 We left home Tuesday afternoon for the short 18 mile trip to Brazos Bend State Park. We followed TX-99 south until it turns into Crabb River Road, then we followed FM-762 to the park entrance. This is a nice drive in the country past George Ranch Historical Park and their herd of longhorns. 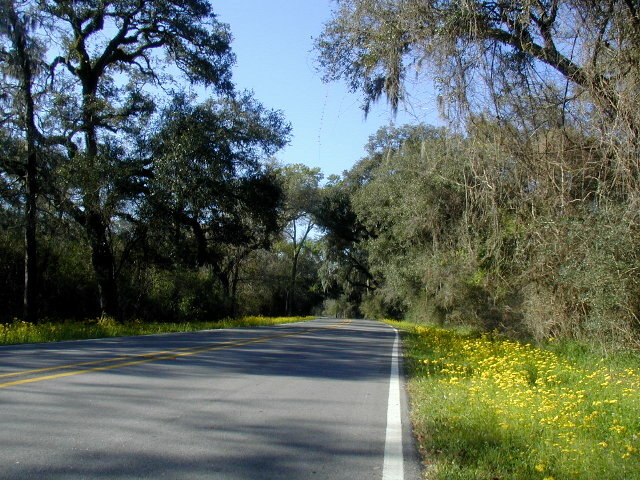 The cotton and corn fields along the road were being readied for planting. 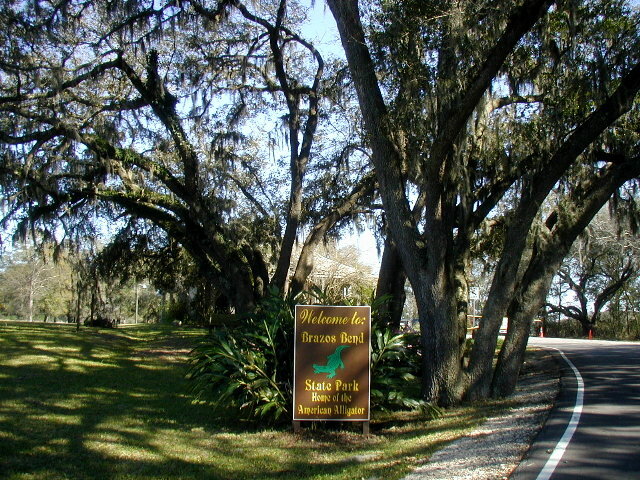 < Entrance to Brazos Bend State Park. 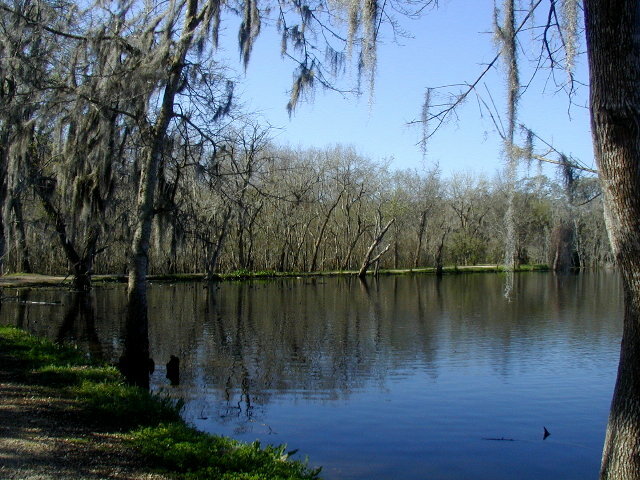 < Our campsite at Brazos Bend State Park. At the park, we had no trouble finding a nice spot (#121) on one of the two camping loops and settling in. The weather was just about perfect for our short visit - cool enough at night to require a blanket yet warm enough in the daytime to allow plenty of outside activity. We road our new bicycles on the bike/hike trails throughout the park and did some hiking. 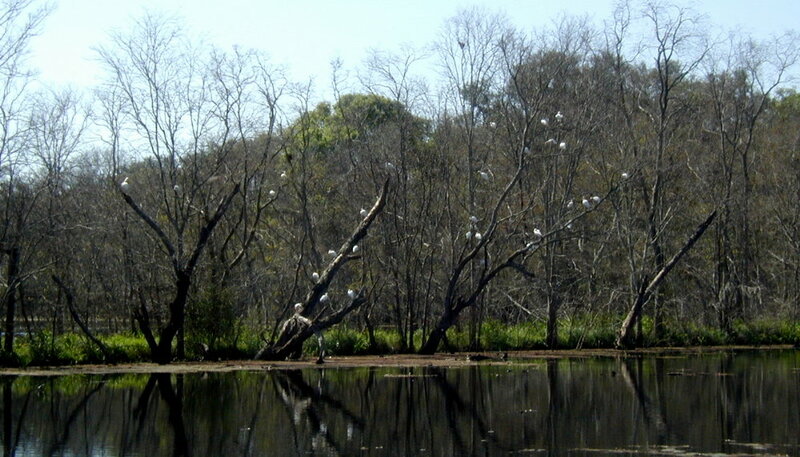 We saw alligators at the lakes and many different water birds and woodland birds that we don't usually see at our standard city subdivision lot. Thursday, some friends from our Bible Study Class came down for the day and we all enjoyed a nice picnic lunch and did some hiking afterwards. < On the road between the park entrance and the campsite. 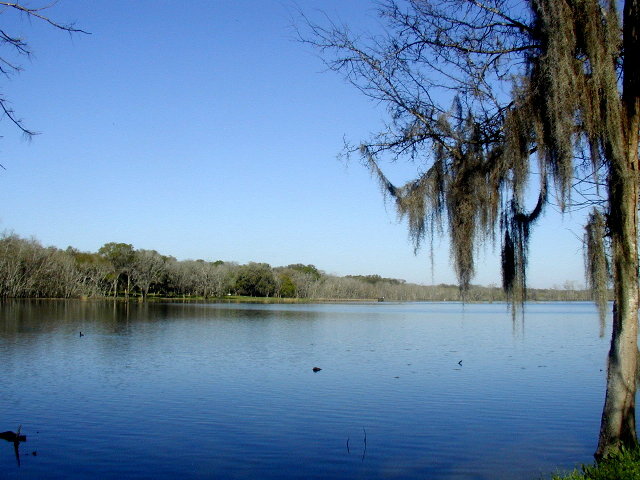 < Forty Acre Lake. < Forty Acre Lake. 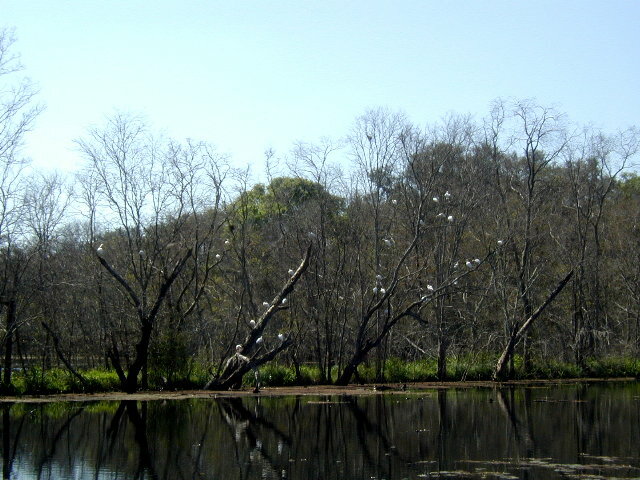 < Waterbirds on an island in Forty Acre Lake. 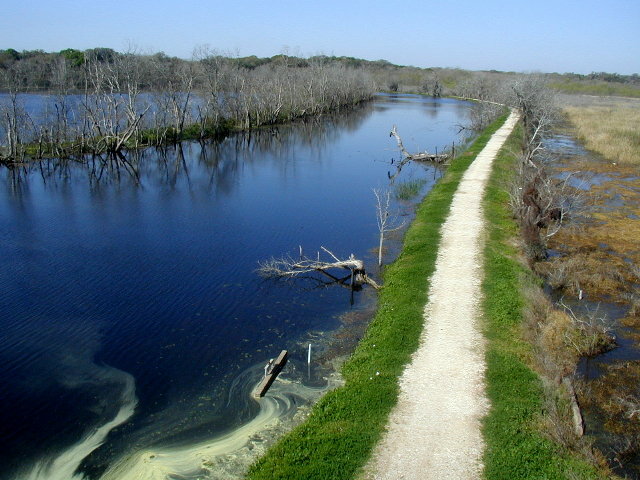 < Forty Acre Lake viewed from the observation tower. 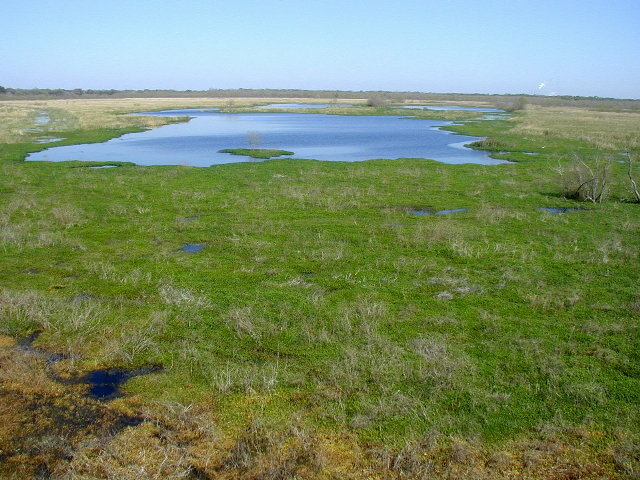 < Marsh area view from the observation tower. LORD, our Lord, how magnificent is Your name throughout the earth! You have covered the heavens with Your majesty.